i. Repair. The application of maintenance services2,including fault location/troubleshooting3, removal/installation, and disassembly/assembly4 procedures, and maintenance actions5 to identify troubles and restore serviceability to an item by correcting specific damage, fault, malfunction, or failure in a part, subassembly, module (component or assembly), end item, or system. j. Overhaul. That maintenance effort (service/action) prescribed to restore an item to a completely serviceable/operational condition as required by maintenance standards in appropriate technical publications (i. e., DMWR). Overhaul is normally the highest degree of maintenance performed by the Army. Overhaul does not normally return an item to like new condition. k. Rebuild. Consists of those services/actions necessary for the restoration of unserviceable equipment to a like new condition in accordance with original manufacturing standards. Rebuild is the highest degree of materiel maintenance applied to Army equipment. The rebuild operation includes the act of returning to zero those age measurements (hours/miles, etc. ) considered in classifying Army equipment/components. B-3. EXPLANATION OF COLUMNS IN THE MAC, SECTION Il. a. Column 1, Group Number. Column 1 lists functional group code numbers, the purpose of which is to identify maintenance significant components, assemblies, subassemblies, and modules with the next higher assembly. End item group number shall be "00. " b. Column 2, Component/Assembly. Column 2 contains the names of components, assemblies, subassemblies, and modules for which maintenance is authorized. 2Services—inspect, test, service, adjust, align, calibrate, and/or replace. 3Fault locate/troubleshoot—The process of investigating and detecting the cause of equipment malfunctioning; the act of isolating a fault within a system or unit under test (UUT). Disassemble/assembly—encompasses the step-by-step taking apart (or breakdown) of a spare/functional group coded item to the level of its least componency identified as maintenance significant (i. e., assigned as SMR code) for the category of maintenance under consideration. 5Actions—welding, grinding, riveting, straightening, facing, remachining, and/or resurfacing. 6This maintenance level is not included in Section 11, column (4) of the Maintenance Allocation Chart. To identify functions to this level of maintenance, enter a work time figure in the "H" column of Section 11, column (4), and use an associated reference code in the Remarks column (6). Key the code to Section IV, Remarks, and explain the SRA complete repair application there. The explanatory remark(s) shall reference the specific Repair Parts and Special Tools List (RPSTL) TM which contains additional SRA criteria and the authorized spare/repair parts. e. Column 5, Tools and Equipment. Column 5 specifies, by code, those common tool sets (not individual tools) and special tools, TMDE, and support equipment required to perform the designated function. f. Column 6, Remarks. This column shall, when applicable, contain a letter code, in alphabetic order, which shall be keyed to the remarks contained in Section IV. B-4. EXPLANATION OF COLUMNS IN TOOL AND TEST EQUIPMENT REQUIREMENTS, SECTION Ill.
a. Column 1, Reference Code. The tool and test equipment reference code correlates with a code used in the MAC, section II, column 5.
b. Column 2, Maintenance Level. The lowest level of maintenance authorized to use the tool or test equipment. c. Column 3, Nomenclature. Name or identification of the tool or test equipment. d. Column 4, National Stock Number. The NationaI stock number oft he tool or test equipment e. Column 5, Tool Number. 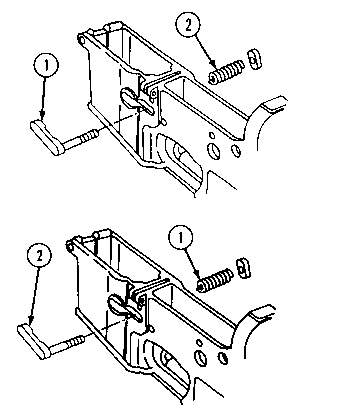 The manufacturer's part number, B-5. EXPLANATION OF COLUMNS IN REMARKS, SECTION IV. a. Column 1, Reference Code The code recorded in column 6, Section Il. b. Column 2. Remarks. This column lists information pertinent to the maintenance function being performed as indicated in the MAC, section Il.